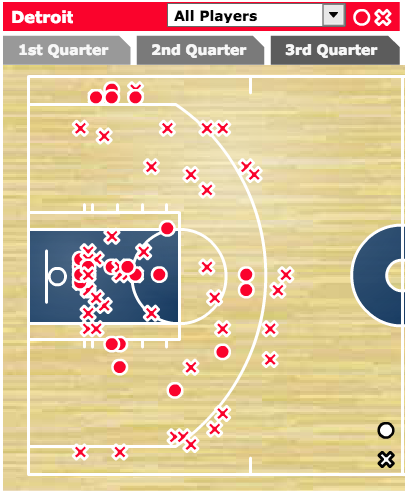 From this point forward, it will be easy to tell a Pistons' player's shot chart by looking at the shot distribution. 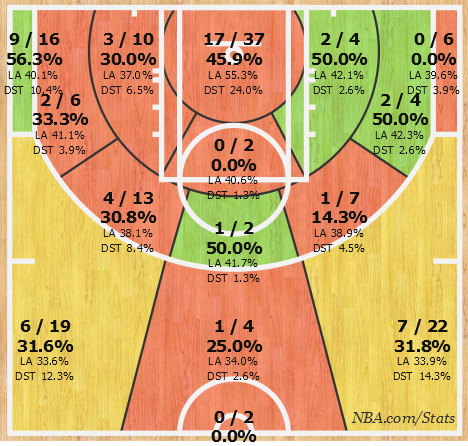 Above are the shot charts of Kentavious Caldwell-Pope and Caron Butler. You can probably tell which one is KCP's by the color, but the indicator is actually the number of shots each has taken from the respective corners: KCP has taken 16 shots in the left corner and only 6 in the right, while Butler has taken 16 shots from the right corner and only 1 from the left. 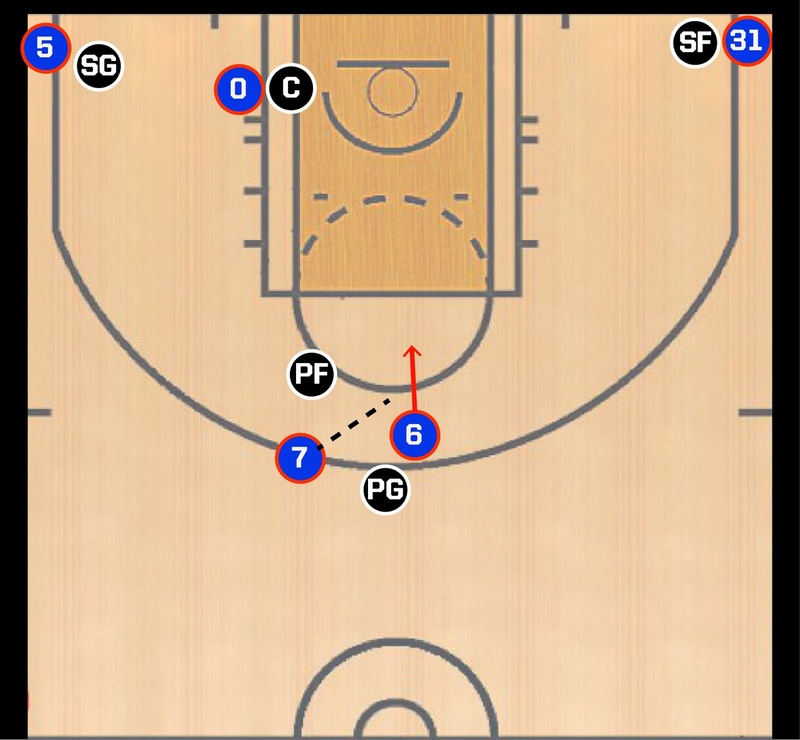 Stan Van Gundy has structured his offense in line with modern offensive thinking: not only do you spread the floor consistently, but you do so while assigning specific corners to distinct perimeter players. Not only does this increase rhythm and comfort for those shooters, but it also allows your offense to implement counters to established plays. This schematic design dawned on me while watching the Pistons lose yet another winnable game on Friday against the Atlanta Hawks. KCP had another terrible shooting game, proving he can't hit shots with defenders in his proximity. Brandon Jennings was injured during a decent, if lackluster, performance. And DJ Augustin almost sealed the loss when he came in for Jennings and shot 4-17 from the field while charting only 1 assist. In spite of all of this, it was foul trouble for Greg Monroe that illuminated the Pistons' best offensive sets of the season and showed why he was coming off the bench to begin the season. Josh Smith led the team in assists, which was not a mistake. With Monroe on the bench for the majority of the first half, the Pistons were finally able to unleash an offensive structure that was sustainable and effective. The Pistons trailed by 19 in the third quarter but, by running nearly the same offensive set every time down the floor, they were able to tie the game early in the fourth quarter. The set begins with KCP in the left corner and Butler in the right. Andre Drummond is positioned on the baseline near the basket, while Smith and Jennings (or as was the case for much of the fourth quarter, Augustin) run a high pick and roll. When Jennings comes off the screen, he has a few options. If his defender goes under the screen and the power forward doesn't show hard, he is free to shoot a three pointer. If his defender follows him over the screen, he begins to probe the lane and looks for a pocket pass to Smith. If the perimeter defender does stay in the corner, the next read for Smith is to see if the opposing center remains on Drummond or helps in the lane. The most promising part of this offensive attack is that it's sustainable. 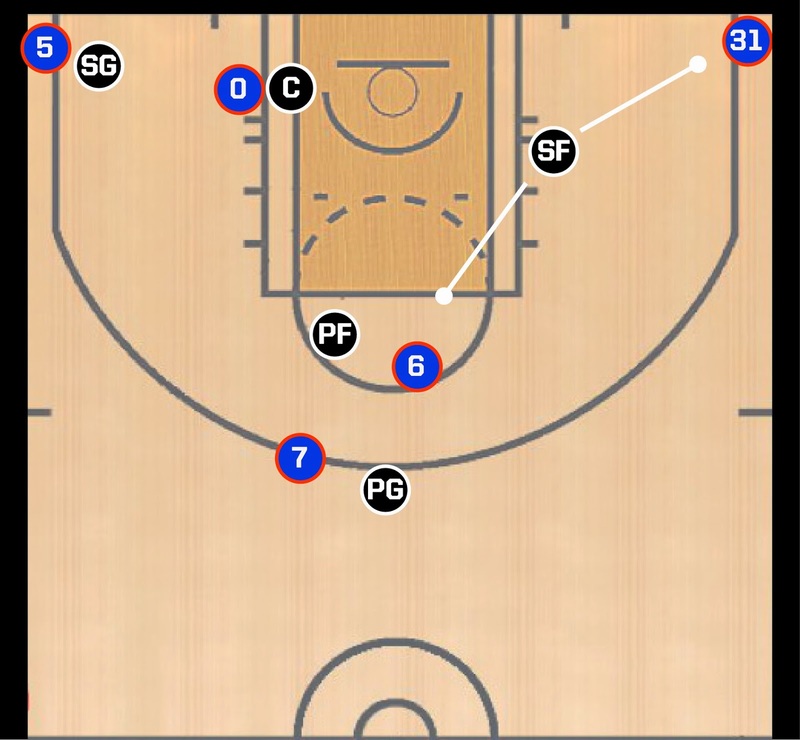 It reliably garners inside shots for Detroit's frontcourt players and/or open looks for the shooters. SVG's insistence on signing a plethora of shooters makes more sense when you see plays like this run consistently. The problem becomes that this play is impossible with Drummond, Monroe, and Smith on the floor together. With Monroe on the bench with foul trouble, the Pistons ran scant few post ups, a play that has been only moderately effective this season, instead opting for a more modern pick-and-roll attack. The question now, as it was before the season began, is whether or not SVG will consistently bring Monroe off the bench. If the results from this game are any indication, he might have to. Ignore the man behind the shot chart. OK, so the elephant in the room: the Pistons shot only 37.3% during this game, including an ugly 4-21 mark from beyond the arc. Part of the shooting woes came from Augustin shooting 4-17 (excising his shots entirely improves the team's shooting percentage by 4%). KCP's 1-7 didn't help any, and his 0-2 from the left corner--which stand out like beacons on the shot chart--hindered the offense as well. But that shot distribution is spectacular. Those Xs in the paint will turn into makes as the team becomes more comfortable with the offense and when they're not playing a team with two bigs as skilled as Horford and Millsap. 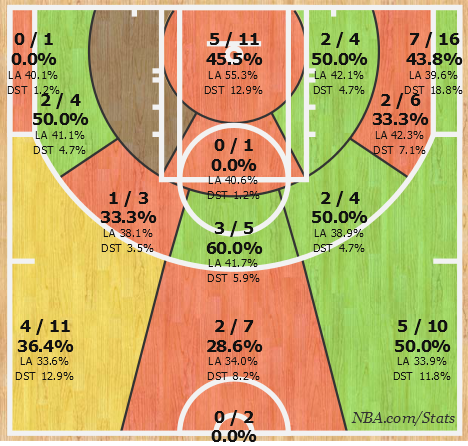 Generating that shot chart is not easy, but it was accomplished largely through the scheme above. This is not 4-out, 1-in. The much ballyhooed offensive system that SVG ran in Orlando with Dwight Howard is dead in Detroit for now, as is the idea that Drummond is a reliable post option. 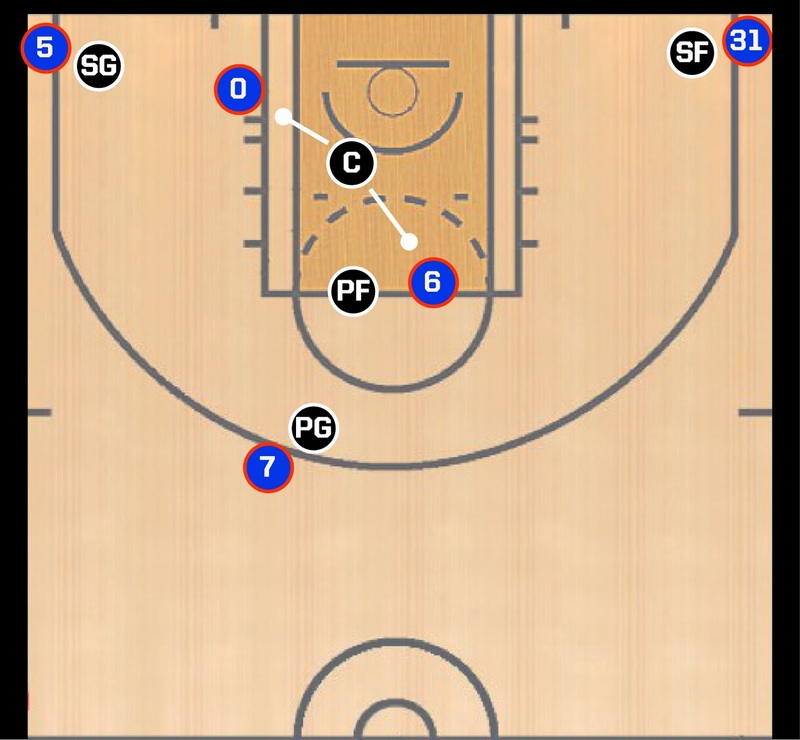 It is no accident that Drummond had his best game of the season against the Hawks: 13 points on 5-12 shooting, 16 rebounds (7 offensive, see the scheme above), 1 steal, 1 block, and only 1 personal foul. While Drummond often gets into foul trouble because of shoddy defense, he also often picked up bad offensive fouls by being overly aggressive on the boards or in the post. When Drummond was asked to stand on the weakside and clean up open putbacks, his numbers looked like those that earned him a roster spot on Team USA. More importantly, it appears that SVG has finally given up the idea that Drummond should be developed in-game. I have no doubt that posting Drummond will become a more prominent aspect of the offense next season, but for now, it appears as though SVG will run a perimeter-oriented, pick-and-roll offense. SVG is smart. Josh Smith can be good. Van Gundy has always praised Josh Smith's passing ability, arguably his most effective offensive skill. Following the last game in which SVG and Smith had a verbal altercation prompting Smith's benching, Smith noted that he needed to find a way to integrate himself into the offense. SVG has developed a system that centers on Smith's passing ability, both getting him more involved in (and motivated by) the gameplan while taking advantage of his passing skills. There are few power forwards in the league that are able to make the accurate, correct kick out passes that Smith does. The other benefit of putting the ball in Smith's hands as he moves toward the basket is that it limits his midrange jumpers. 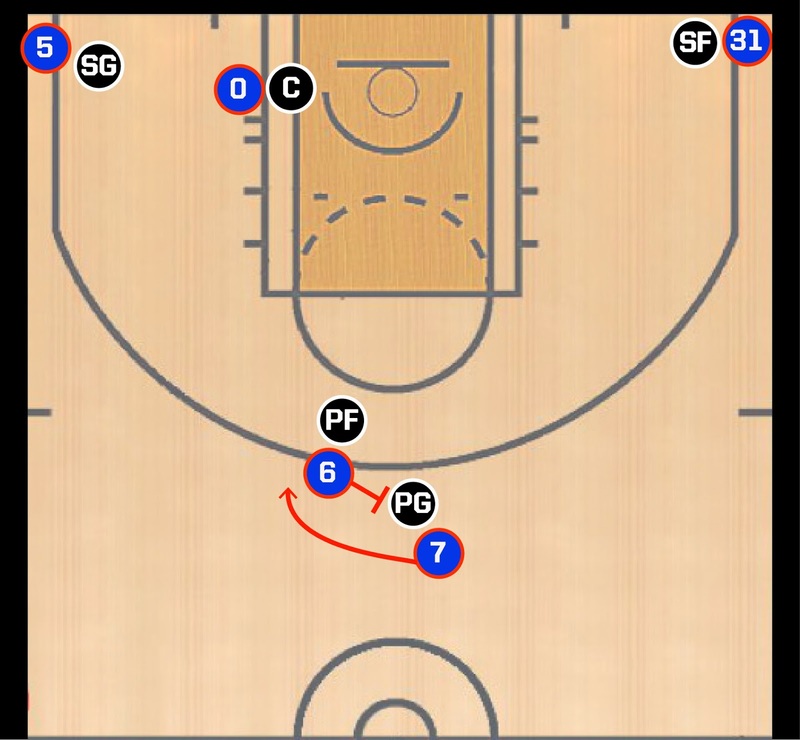 Smith's inclination to shoot long 2s is nurtured by an offense that has him stand on the perimeter and catch the ball with his defender sagging. When he's given the ball with a head of steam, his offensive game expands and he becomes less of an offensive hazard. Brandon Jennings is essential. I do not like DJ Augustin. He is a prototypical over-dribbling ball stopper. This play emphasizes what I dislike about his play. Augustin struggles getting into the lane with the purpose of creating for his teammates. As the fourth quarter progressed, it was clear that the Pistons were going to lose because he couldn't get Smith the ball in the correct position, ruining the spacing of the scheme. I have been critical of Jennings' pick-and-roll game in the past, specifically because I thought he over dribbled and failed to create for his teammates. But this season has seen a dramatic shift in his pick-and-roll proficiency. Part of this has to do with SVG's schemes; an underrated aspect of Van Gundy's talent is his point guard development. Anyone who can turn Rafer Alston and Jameer Nelson into every day starters has something going for him.